There are moving parts in the moving parts and it’s hard to get a footing. It’s difficult to gauge progress or movement forward or back. There is no back, there is no forward. The simple fact of making it through the day intact physically and psychologically is its own reward, its own miracle of life calling for itself everyday. Most people here find their own crevice, their niche, a small corner of the city, the campo, the inside of walls, the terrain and create their sanity there. To live fully, openly and expansively here has too high a price. Disorder and chaos are always near – reminding us how fragile existence is and how quickly one can fall long distances. There is no cushion, no fat, to protect your head from cracking like an egg against the asphalt. A million pieces that no one will pick up. Or will they. I finally give in and release. In one day many lives are lived. I too sleep early, rise early, on dog time, I wake with the church bells tolling, the bus ayudantes at 6am yelling “Guate! Guate! 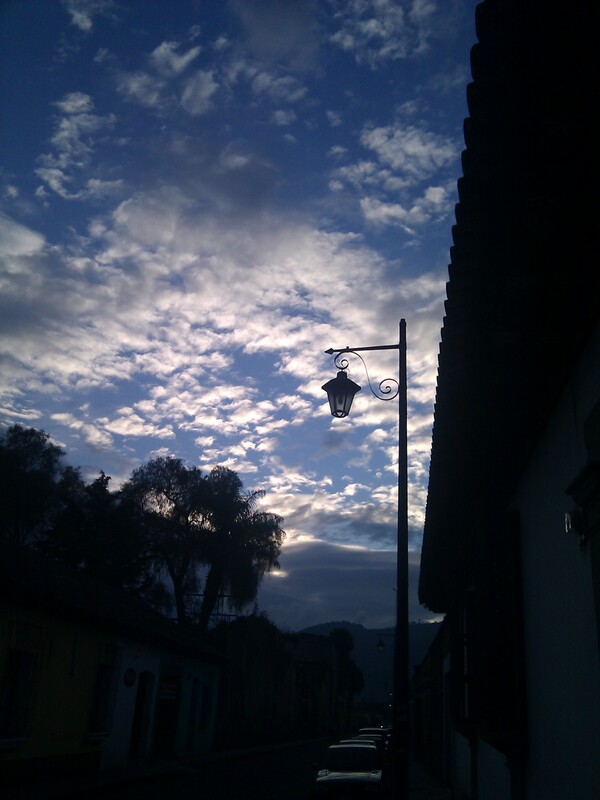 GUATEMALA!” and the roar of the buses down La Antigua’s cobblestone and disappearing to the city. The gaggle of uniform-clad students move as one down seventh street amid the thick billows of black smoke, dust, dogs, pigeons, horses trotting down with tourists. It’s a mise-en-scene, you step into it and your part of the no-story story. Everyday I push myself to breathe more, to pause and reflect more on each moving part like reaching out in the dark and grabbing the elephant. Turning the part around in my hand for a moment and then letting it slip into its own ether, it’s the reality that is ungraspable, intangible that makes me uneasy everyday. I watch my dog take it in so clearly in his eyes, so present, so alive in it. I bend my head down, bracing for the punch. Posted on Saturday, March 31st, 2012 at 10:16 am. Filed under: Blog, Team Guate	RSS 2.0 feed.